The heritage of Vietnam is spans more than a millennium, and is continuous along the city streets and within the countryside. On this custom tailored tour you will experience the cultures that have created the modern day country, from the imperial cities to French Colonialism, bringing you the opulent legacies of emperors and the fabulous architecture of French remnants. 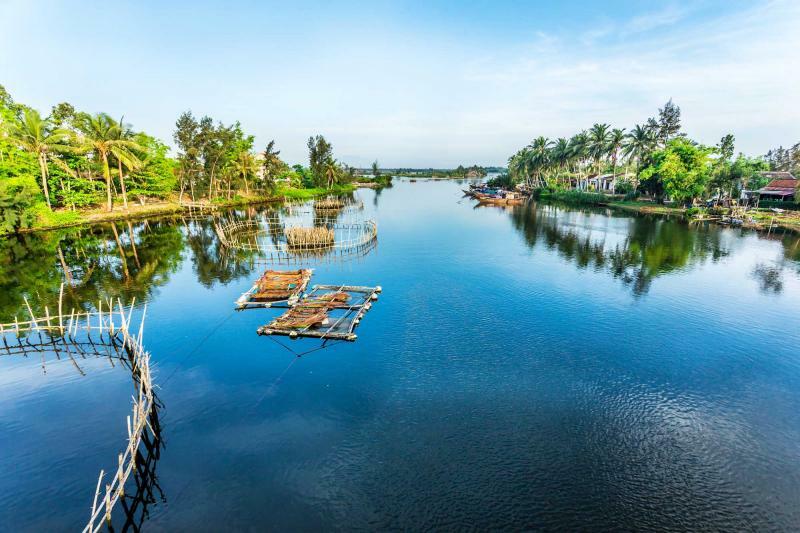 From tranquil lakes in the heart of Hanoi to sensational cathedrals in Ho Chi Minh City, you will find luxury and charm, character and allure within the cities and the mountains, the rivers and the forest. 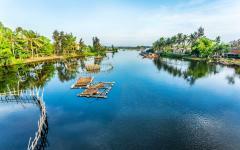 The luxuries of Vietnam are mixed within the heart of major cities and the mountain resorts of the country’s colonial past. On this 12-day excursion you will find the comforts brought by the French and the lavishness that has filtered through the landscape for centuries. From the villages to old markets, careening waterfalls to substantial stone guardians, there is endless opulence in the color of the forest and the sounds of the stunning mountain nights. Whether you are interested in local craftsmanship or garden houses, there is only beauty to be found along the road through Vietnam. 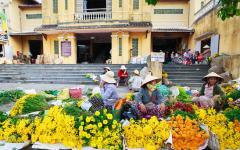 Your exploration begins with your arrival in Hanoi, the capital of Vietnam. You will spend three days exploring the ancient sites of a city that dates back to the 11th century. 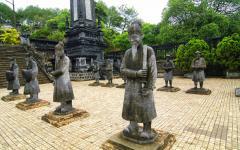 Enjoy the treasured Water Puppet Theater and visit the stunning relics along the banks of Hoan Kiem Lake. You will also have time to experience the sensational Museum of Ethnology that will give you insight into the diverse tribes that live within the vast mountains. 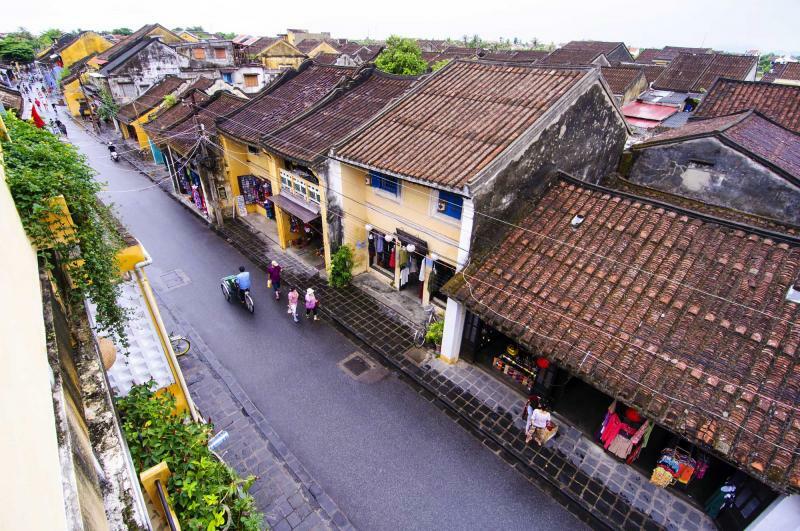 Find yourself in Hue, the ancient Imperial City, which continues to boast a remarkable connection to its grand past. 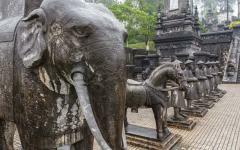 From the Perfume River to the wondrous emperors’ tombs you will find the architecture and artistry mesmerizing. 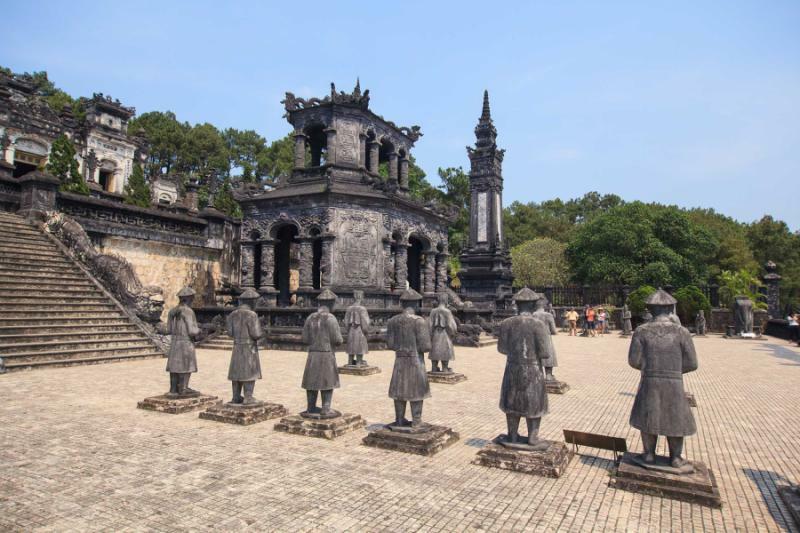 Before your transfer to Ho Chi Minh City you will visit the Demilitarized Zone where a small museum encapsulates the vast difference in the area from the 1960s to present day central Vietnam. 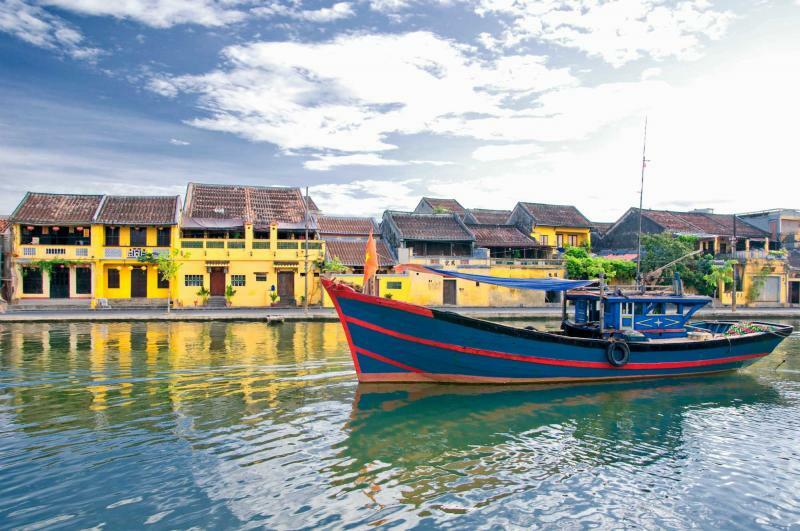 Once in the commercial capital of the country you will spend your days touring through the large city that buzzes along the banks of the Saigon River. On the outskirts of Ho Chi Minh City is the opportunity to explore the meandering network of the Cu Chi Tunnel system. Depart for Da Lat to spend three days in the famed French Colonial city that borders ethnic villages and sensational nature. Whether wandering through the city or trekking through the woods you will find beauty, grace, and even the occasional hill tribe before returning to Ho Chi Minh City and eventually making your way home. Your arrival in Hanoi is met with a warm and exciting welcome with your private transfer that will soon have you relaxing within your luxurious accommodations within the city center. You feel an immediate connection to the city that has blended its tradition and evolving cityscape nicely, from skyscrapers to the cultural neighborhoods in Old Town. Even colorful greenery swaddles Hoan Kiem Lake within the historic center. Bicycles whirr with locals wearing conical hats to protect themselves from the sun while cyclos, bicycle-taxis, roam through the streets that date back a millennium. In the evening you will indulge in a taste of Vietnam with dinner and a chance to view the famous Water Puppet Theater. The show is a collection of cultural mythology; the presentation was born from farmers in flooded paddy fields during monsoon season. 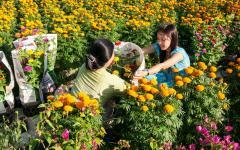 The jovial feeling is immediate and you know that Hanoi is a city of which you have seen no equal. The morning brings with it the fresh aroma of Vietnamese coffee, filled with rich dark roast that fills you with flavorful energy and has you looking forward to your exploration of the day. Your guide brings you out into the city that brims with excitement, from the floral scents of the Hang Da Market to the opulent architecture that acts as a reminder of the French Colonial past. The peaceful quarters of Hoan Kiem Lake offer you a sample of the local getaway within the dangling greenery that almost blocks the remaining city. 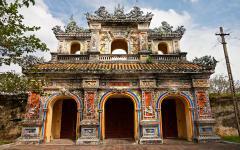 Constructed in the 18th century, Ngoc Son Temple stands along the lake’s edge at the center of Jade Island. Ripples form on the water stemming from the endangered soft shell turtles that swim in the lake, often making a home near the Turtle Tower’s base. The scarlet bridge that leads to the temple gracefully arches over the water. Throughout the day you will find Hanoi’s history brimming within the modern streets, from the Opera House to the Ho Chi Minh Mausoleum, but along the water of Hoan Kiem Lake you have found the heart of the city and it beats with quiet pride. The new day brings another chance to stroll along the city’s streets and to discover the beauty of Hanoi and the surrounding country for which the capital represents. With the day at your leisure you are able to expound upon the diversity whether within or outside of the city’s main streets. The Museum of Ethnology in Hanoi gives you insight into the variety of ethnic groups within the country, dedicated to the heritage and preservation of socio-cultural diversity. The building is a modern construction which takes great care to keep the proud displays of traditional culture and the collection of diverse tribal material approachable. From art to artifacts, and everyday objects, you will be able to step inside the distant and often unknown cultures that reside within the hills. Within colorful, geometric textiles and intricate jewelry, you will become connected to a heritage you may have not even known. Wander through the courtyard that is filled with a small stream and little bridges and where you will come upon traditional homes, including a stilt house of the Tay. Strong wooden pillars hold the thatched roof and open windows offer a refreshing cross breeze. When morning washes over the city, and after you have delighted in your breakfast, a private transfer will take you to the airport where you will soon find yourself within the ancient Imperial City of Hue. The historic splendor of the city remains, not just within the elegance of various emperors’ tombs but also along the famous citadel that continues to house a large portion of the city’s population. Come to the moat and you can already see, not only the opulence of the historic structure, but also the beauty of the waterway that surrounds the entire complex, stretching over 90 feet across and spotted with large lily pads floating on the surface. With 10 fortified gates and over six-miles of thick stone walls, the current state of the structure only adds to the allure of the city at its peak. Walking through the main entrance brings you to a tripartite gate where the center arch was used only for the emperor and his procession. Today you can see the flag flying over 110 feet high above the entire complex. You will also find the Nine Holy Cannons that represent the four seasons and the five elements, bringing together power and nature. 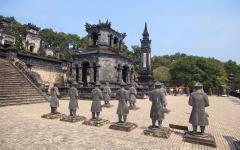 Another day within the remarkable city of Hue brings you out and about to witness the grand commemorations of the past emperors. 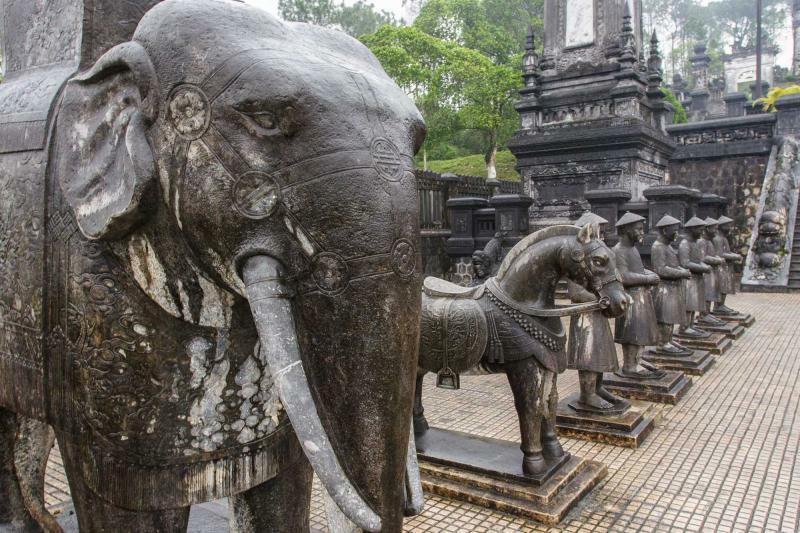 From Tu Duc to Khai Dinh, the royal tombs were created with extravagant detail and passionate dedication leaving a known legacy for the generations to come. 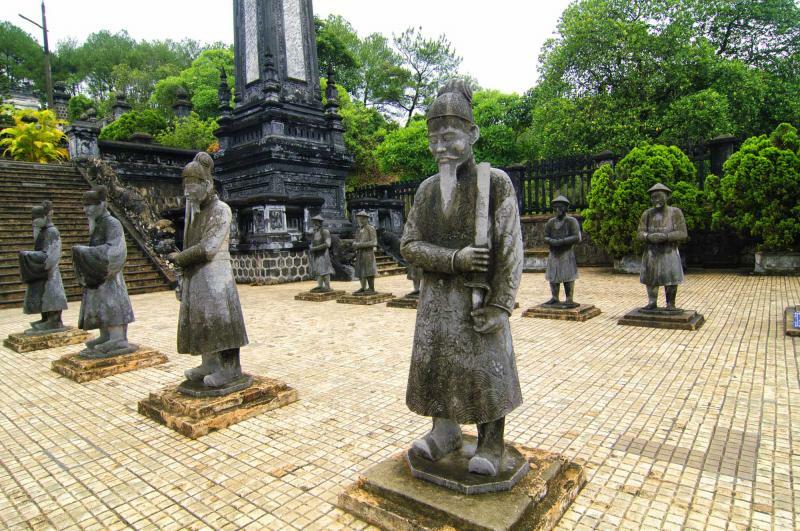 The sublime setting and lovely architecture of the Tomb of Minh Mang has brought renown to the surrounding forestry. Located on the banks of the Perfume River, you can wander across the stone bridge that takes you over the crescent-shaped Tan Nguyet Lake, where a staircase climbs into the air flanked by dragon banisters. The water is calm and air is cool within the lavish greenery which makes you feel like you are alone in an archeological site. At the top of the staircase is the emperor’s sepulcher; the doors open once a year on the anniversary of Minh Mang’s passing. In the evening you will find yourself within one of Hue’s famous garden houses. The traditional tile roofs slope down beneath lavish, arching trees and sprouting lily pads. Soon the aroma of ginger and fresh noodles overtakes the flora and brings you the unique flavors of the city. Today you will have the opportunity for a half day tour that will take you out of Hue and into the countryside along the historic remains of the Demilitarized Zone. Within Khe Sanh Combat Base you find the open space within the surrounding lively mountains filled with swaying trees and tall grasses. The peaceful quality of the area today is a contrast to the heavily battled area of the late 1960s. A small museum located here contains old photographs of the time, along with a reconstructed bunker. Two helicopters sit on the helipads as reminders of what took place within the valley. The scent of coffee plantations drifts in from the fields that now linger along the foothills. In the afternoon you will catch your flight to Ho Chi Minh City. 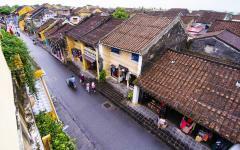 The city is the commercial capital of Vietnam and was once affectionately known as Saigon. Ho Chi Minh City is full of energy which reaches from the skyline to the shores of the Saigon River. The aromatics of restaurants and the vivacious pulse of commerce seem to be never ending. At the heart of the rising cityscape you find the elegant artistry of the Cathedral of Notre Dame. In the late 19th century the material used to construct the cathedral was shipped from France creating an iconic touch of a colonial past. The towers stand 190 feet tall with the rose window as the central image. Once inside the familiar scent of myrrh enraptures you within the lofted ceilings and mesmerizing shapes of the tiled floor. The graceful structure also brings a tranquility that takes you away from the energetic pulse of the surrounding streets, giving you a moment to connect to the art, the history, and the evolving culture of Saigon. Outside of the bustle of Ho Chi Minh City, within the jungles that stretch down to the delta and up to the central mountains, you will come to the Cu Chi Tunnels. Containing over 170 miles of networks and just 20 miles away from Ho Chi Minh City, the tunnels continue to burrow through the countryside, constructed deep enough below ground to not have been effected by rumbling tanks or aircraft. Ben Dinh is one of the most visited tunnels and is where you can see the extent of the actual network crisscrossing the beneath the landscape. When you enter the system you notice the shift in the air, from the tropical warmth to the underground cool. At a height of around four-feet, you can walk through the narrow channels and come to the remnants of a tank sitting within a eucalyptus grove. 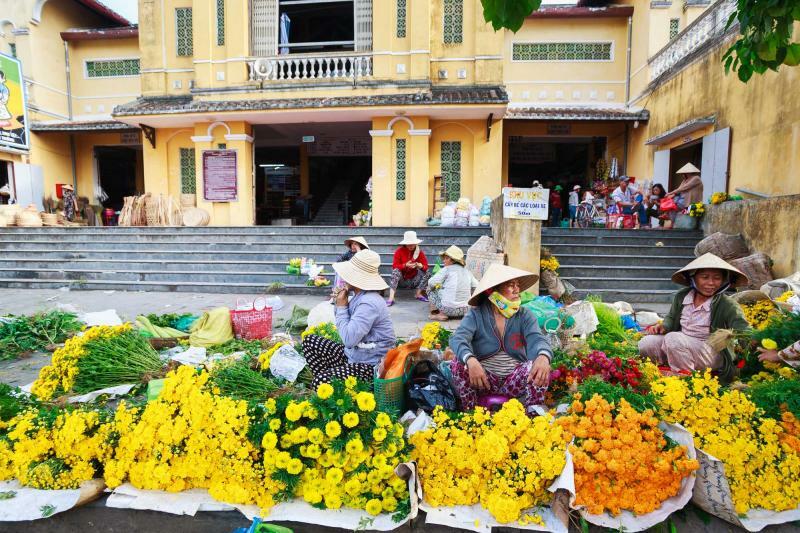 The morning is yours to explore Ho Chi Minh City allowing you to stroll along the streets of the Old Quarter or to visit Hang Da Market once more to enjoy the scent of fresh flowers blending with the vibrancy of the new artwork. 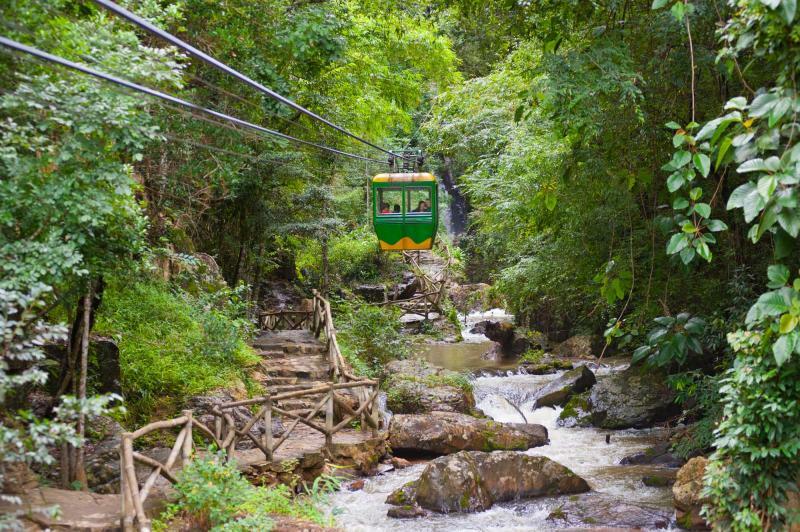 In the afternoon you will make your flight to Da Lat, where the cool mountain air sweeps through the surrounding peaks and foothills. The villa contains influences of Art Deco décor where square angles connect to the rotund entrance. The back courtyard maintains its charming shape with its manicured grass and delightful geometrics. You can visit the emperor’s office within the palace, an imposing ambiance filled with regal and military seals enhanced by the large desk and collection of spears and crossbows. The surrounding landscape is lush and lavish bringing you a sense of tranquil beauty encompassing the opulent home of a former ruler. 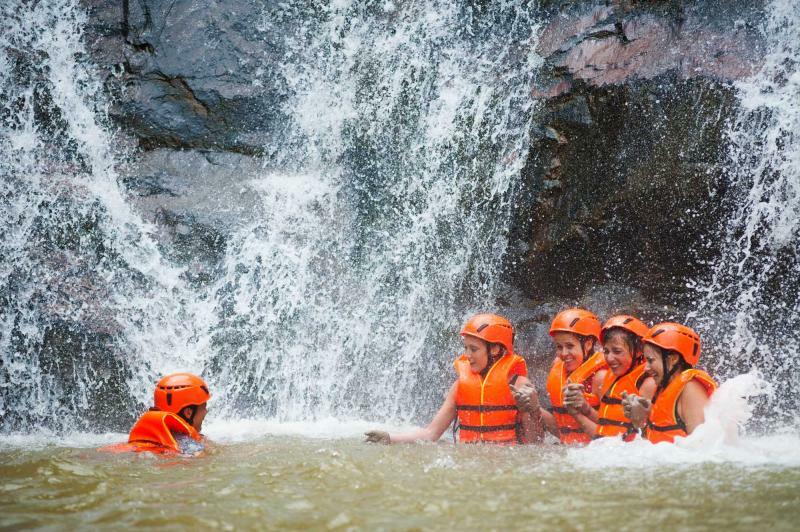 Outside of the charm of Da Lat, an adventure into the graceful woods will bring you to the celebrated Datanla Waterfalls. The cool climate and the lovely shaded forest offers a comfortable place where you can savor the views of the wildlife within the cedar aromatics of the easy walking trail. 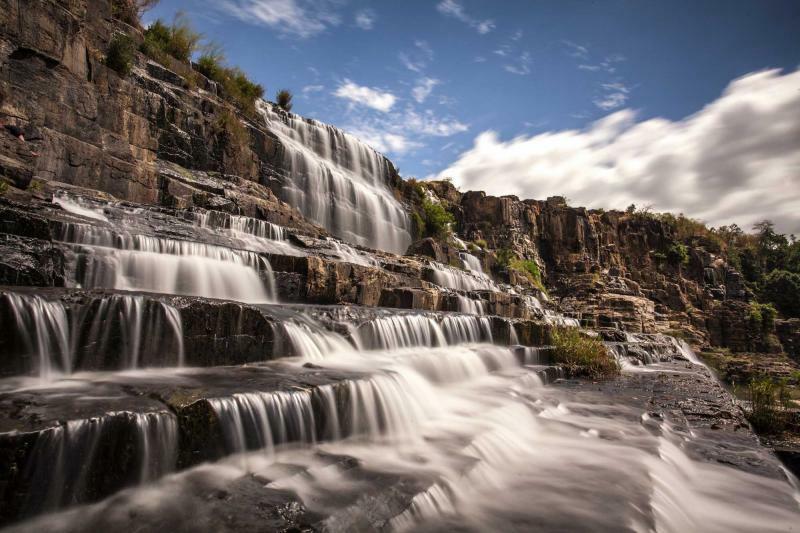 You can almost hear the rush of water in the distance before the falls even come into view. 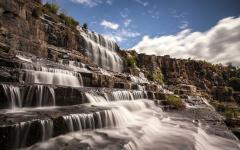 The roaring sound guides you to the gorgeous cascades of water careening over the cliff to the iridescent water below. A footbridge arches over the water allowing for an overhead view of the winding whitewater and the protruding rocks. 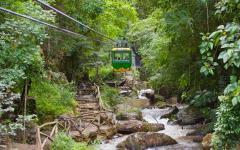 For a unique panorama of the forest and falls you can take a ride along the bobsled track that weaves down the hillside with the surrounding leaves, flashing falls, and misty air all around you. The sun washes light over the old colonial city and you can see the largest peak rising over 5,850 feet above sea level. Today you will journey on a half-day tour to visit the Lat Village at the foot of Langbian Mountain. The ethnic minority village sits at the edge of strawberry and coffee plantations which bring vibrant reds and greens to the open valley before the rising mountain. The women weave wonderful textiles with vibrant hues and intricate patterns and traditional stilt houses rise above the tall grass. Also known for remarkable flowers, the region seems to sparkle in waves of color, from reds to purples to yellows. In the afternoon you will return to Ho Chi Minh City with the evening at your leisure. For a delicious end to your day you can dine at Nha Hang Ngon, an endearing restaurant that allows you to sample a wide range of Vietnamese cuisine within a pleasant ambiance. Breakfast is accompanied by the rich flavor and scent of fresh Vietnamese coffee that lifts you up to the energetic streets of Ho Chi Minh City. Soon your private transfer will ferry you to the airport where you will catch your return flight home. Until then you can meander through the city streets once more visiting the comforts of the Hideaway Café for a final tranquil sip of coffee within the colonial décor, or delighting once more in a crispy rice pancake at the Ben Thanh Market. Eventually you will journey home but there is always so much more to see. 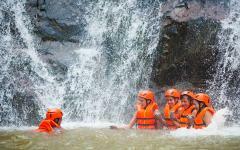 For ideas on further customization, you may want to read the reviews for Vietnam travel agencies. "It was a very wonderful trip. The travel company planned everything perfectly well." "Our trip was enjoable and went smoothly."